Talk Nigeria Blog : One on One Web Design / Development Training in Surulere, Lagos. 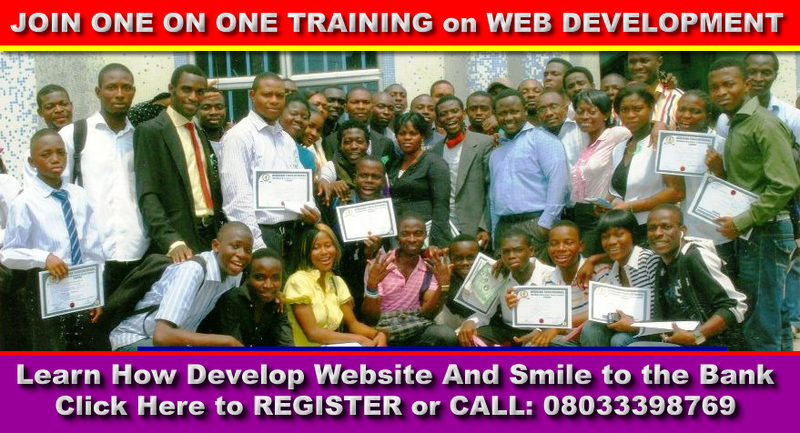 One on One Web Design / Development Training in Surulere, Lagos. We are at it again! We are organizing one on one Website Development Training Using WordPress Content Management System Software to develop professional websites. It is a 5-Day Training in our office here in Aguda, Surulere, Lagos. You don’t need to have prior experience. We can take you from novice to expert web developer in just 5 days if you are determined to succeed. It is actually your determination that will perform the magic of making you an expert web developer in 5 days. We have the experience, we have been training people since 2006 and we have met different people with different styles of learning. In all, we were able to impact knowledge to them. At the end of five days training, you will acquire the skills and confidence to develop and manage WordPress websites for yourself or for clients that pays you not less than N50, 000 per website. Our course will not only give you access to WordPress Development Training but we will also start from teaching you how to register domain names and how to host websites for yourself and your clients as well. This means that at the end of training, you will get all the knowledge you need to start your business in this industry. You will stand a chance of making money while you sleep if develop striking ideas in Internet business. Internet Business is another course we teach which is not included in Web Development Course. We also teach people other avenues of making money from the Internet e.g. Blogging, Internet Marketing. Affiliate Marketing etc. If you are interested, contact us.